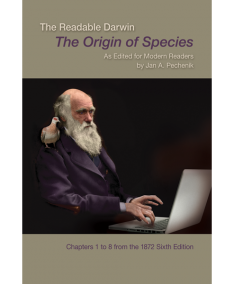 This website is a companion to the textbook The Readable Darwin by Jan A. Pechenik, published by Sinauer Associates. Below are all of the links and videos referenced in each chapter of the book. Click a link to open it in a new window. Link 1 With the following link, you can see all of the changes that Darwin made for each of the six editions of The Origin of Species. 7.1 Basic information about bryozoans and their avicularia. Click the link about half-way down the page to see a video of avicularia in action. 7.2 Interesting information about the pedicellariae of sea urchins and sea stars, including videos of these structures in action. 8.3 Answering a 2,000-year-old question about bees in an amusing way: Why hexagons? 8.4 Fascinating recent evidence that some behavioral learning may be passed along to offspring, through the modified expression of existing genes (based on Dias and Ressler. 2014. Nature Neuroscience 17: 89–96).